Consumers please visit our online store - the oldest serving Greek Deli in the UK since 1952. 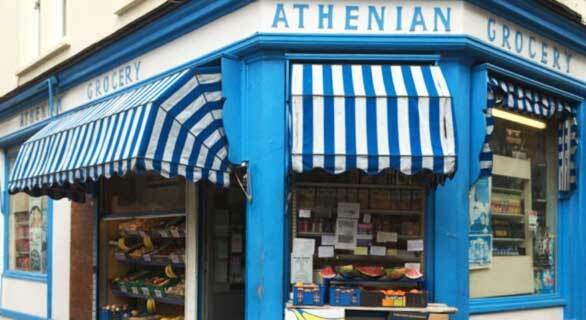 Please follow the link to our consumer shop, The Athenian Grocery, which has the distinction of being the oldest surviving Greek Deli in the UK. Situated in central London, the physical shop was established in 1952 and its reputation as a source of premium Mediterranean Food and Drink was soon established and is still unparallelled. The shop sells all the products J&P sell wholesale including olive oil, Feta, Halloumi, olives and a whole lot more – freshly made Greek Loukanika (spicy wine-soaked sausages), ready to eat, home-cooked Spanakopita (Spinach and Feta pie) and Koupes (bomb-shaped, Bulgar – encrusted mouthfuls of succulent Greek street food). Tempted…? Please take a look at the range – if you have any special requirements the experienced staff at The Athenian will be glad to assist.